The West Virginia Legislature is celebrating the 30th anniversary of the Doc for the Day Program. The Legislature has a long history of providing educational programs during the legislative sessions which include the Legislature’s Page Program for students, grades 6 thru 12, undergraduate and graduate internships that gives college students the opportunity to work with lawmakers and staff on a daily basis, and the Doc for the Day Program. The program is sponsored by the West Virginia Chapter of the Academy of Family Physicians (WVAFP), and is authorized every session under agreement of the Speaker of the House of Delegates and the President of the State Senate. William Ferrell, a former administrator for the WVAFP, created the Doc for the Day Program in 1989, which was the first of its kind anywhere in the nation. Ferrell saw this program as an opportunity to build a relationship between the family physicians around the state and the legislature. The Doc for the Day Program gives family physicians from across the state, including practicing physicians from Marshall and West Virginia University’s medical schools, to volunteer their medical services for a day during the 60-day legislative session. Physicians who volunteer their time provide medical services to legislators, legislative staff, government officials, and visitors at the Capitol. Health insurance is not required, no fees are charged, and appointments are not necessary for medical services rendered by the Doc for the Day. The family physicians work in the Capitol Dispensary, but are available for house calls anywhere in the Capitol, or the Capitol Complex. If the Doc for the Day is not available, a full time registered nurse is also available for assistance. 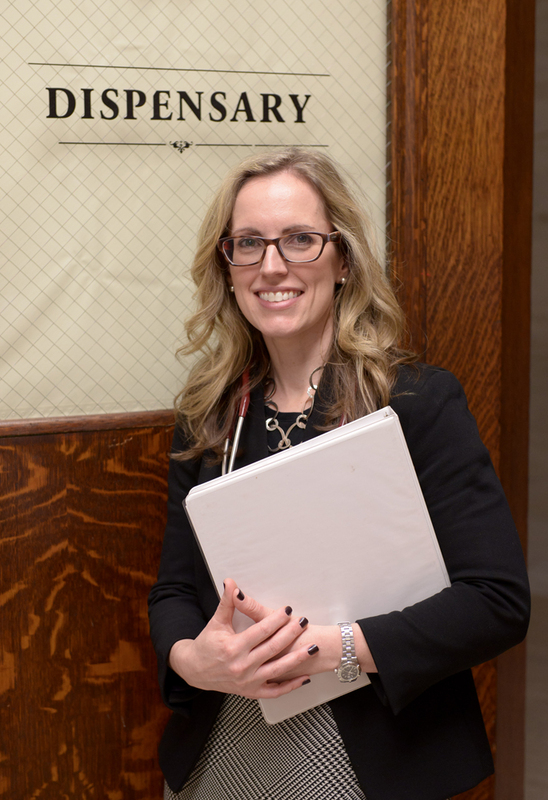 Lori Brown, the Capitol’s registered nurse, just started in her new positon this legislative session, and has already fallen in love with the job. The program is a great educational tool for both the family physicians and for the legislatures. Family physicians who volunteer their time at the Capitol get to immerse themselves into the legislative process that directly impacts the medical industry, and the program also educates legislative leaders and staff about the importance of family physicians. The most important part of the program above all is treating the patients that walk in every day. Mary Ann Maurer, President of the WVAFP and faculty member at Charleston Area Medical Center, has participated in the program five times since 2014, and enjoys coming back every time to work with patients. The Doc for the Day Program is the most successful program by the WVAFP, and is probably because of money and man power it saves the Legislature. By providing a family physician in the Capitol every day and free of charge, it saves valuable time for legislators that would have had to leave the Capitol to be treated for medical reasons. As of this year, approximately 50,000 patients have received free medical service since the creation of the Doc for the Day Program in 1989, and averaging roughly 1,700 patients per legislative session. As of 4:00 p.m. Friday, February 8, 2019, the 31st day of the first regular session of the 84th Legislature, 563 bills have been introduced to the senate. Of those bills, 78 have passed and have been sent on to the House for further consideration. SB 16: The bill would allow the expenditure of unexpended sums and surplus funds of the Wyoming County Commission to be placed into a special fund to establish a K-9 Unit for drug searches. SB 30: The bill would provide that for the taxable years beginning on or after January 1, 2019, the tax imposed by W.Va. Code §33-3-15 is discontinued. That section requires every life insurer transacting insurance in West Virginia to report annually to the Insurance Commissioner the gross amount of annuity considerations collected and received by it during the previous calendar year on its annuity business transacted in this state. Such amount is then taxed 1% of the gross amount of the annuity considerations, less annuity considerations returned and less termination allowances on group annuity contracts. SB 100: The bill would modify the fee added to court costs in criminal actions, excluding municipal parking ordinances and to the amount of any case or property bond posted for a violation of criminal law. The current fee is $2. This bill would change that to $12. SB 127: The bill would add to the duties of probation officers that of drug and alcohol testing of family court litigants. SB 154: The bill would require county boards of education to allow school facilities to be used for the funeral or memorial service of a community member of distinction who was a military service member, veteran or who served as a first responder. Additionally, the bill would prohibit a funeral or memorial service held at a school facility from disrupting classroom instruction, other scheduled school event, or other official governmental use such as when a school serves as a polling place for an election. SB 157: The proposed amendments would allow a vendor’s contract to be cancelled if it was awarded in error, allow related parties to a debarred vendor to also be debarred, authorize the Purchasing Division to recalculate a vendor’s extension price provide for reciprocal preference in limited circumstances and providing requirements to claim the preference, allow for best-in-class solutions in evaluating requests for proposals and allow for standardization of commodities. SB 163: Is a rules bundle which includes eight other rules all relating to the West Virginia Department of Environmental Protection (DPEP). The bill would modify an existing DEP rule which establishes a program of national emission standards for hazardous air pollutants as promulgated by the United States Environmental Protection Agency (EPA) pursuant to the Clean Air Act (CAA). SB 175: The substantive changes to the rule add hospital emergency rooms and departments to the list of mandatory reporters. Secondly, the reporting requirements were expanded to include reports on not only suspected overdoses but reported or confirmed overdoses. SB 237: The bill would require law-enforcement agencies with jurisdiction to accept a missing person complaint, and specifies the minimum information that law-enforcement agencies must attempt to collect from a complainant. It would require law-enforcement agencies receiving a missing person complaint to ensure that a report of the complaint and relevant information is entered into the state-level West Virginia Automated Police Network and when applicable, several other national databases, including those maintained by the Federal Bureau of Investigation. SB 256: The purpose of this bill would be to allow certain deductions to be made from individual personal income tax refunds for purposes of providing nursing home and health care for veterans in the West Virginia Veterans Home and for purposes of operating and maintaining the Donel C. Kinnard Memorial State Veterans Cemetery. SB 263: The bill would limit the amount of pay which a member of the legislature may receive following the regular session of the Legislature when a state budget has not been passed. It also clarifies that a member is entitled to receive no more than five days of compensation for any extended or extraordinary session if a budget has not been passed. SB 267: The bill would require the State Board to adopt a policy detailing the appropriate level of computer science instruction available to students at each programmatic level and requires the Department of Education to develop and offer professional development opportunities. The bill would also authorize the Department to partner with high-quality computer science professional learning providers in developing the professional development opportunities. SB 323: The bill would establish a special revenue fund for capital improvements to Department of Agriculture's facilities. The fund is named the “Capital Improvements Fund — Department of Agriculture Facilities.” The bill also requires that money in the fund be used exclusively by the Commissioner of Agriculture to fund construction and capital improvements to facilities owned or occupied by the Department of Agriculture. SB 324: The purpose the bill would be to allow the Commissioner of the Department of Agriculture to hire a general counsel and other support staff as needed in order to carry out his or her duties. SB 346: The purpose of this bill would be to equalize the reimbursement rate that justices of the Supreme Court and Circuit Court judges receive for business travel while using a personal vehicle to make it identical to the rate which other state employees receive. SB 357: The bill would repeal the sections of state code that established the Division of Justice and Community Services, amends the sections of state code relating to the Division of Administrative Services to transfer the administrative duties and employees of the Division of Justice and Community Services to the Division of Administrative Services and transfers the duties and obligations formerly within the responsibility of the Division of Justice and Community Services to the Division of Administrative Services. SB 358: The bill would provide the Division of Protective Services of the Department of Military Affairs and Public Safety (DMAPS) an exemption from the requirement to purchase goods through the Purchasing Division of the Department of Administration. The exemption would apply to “equipment necessary to maintain security at the Capitol Complex and other state facilities” as may be determined by the Secretary of DMAPS. SB 361: The bill would authorize Public Defender Services to establish a division to represent persons in habeas corpus matters. The bill would also allow for public defenders to decline appointments based on conflict of interest or excessive caseloads, and bill authorizes the employment of attorneys and support personnel to staff the office. SB 369: The bill would add definitions for the terms “covered entity” and “covered individual”. If a pharmacist substitutes a drug pursuant to the provisions of this section, the patient shall receive the savings which shall be equal to the difference in the patient’s acquisition cost of the product prescribed and the acquisition cost of the substituted product. This provision may not apply if the patient is a covered individual. SB 373: The bill would allow the Division of Corrections to withhold monies received by inmates from court judgments and civil settlements even if the awarding court fails to deduct the monies from an initial award. SB 387: The bill would repeal code which deals with extradition for purposes of moving current law to a new article in Chapter 62 for purposes of clarity, adds a new article which incorporates language from sections repealed, adds language which clarifies that persons in other states who are improperly released from custody before completion of a sentence and subject to extradition and updates titles of persons and entities in the process. SB 389: The bill would amend and reenacts a section of state code relating to the lawful method for a developmentally disabled person to purchase a base hunting license. It would allow for a developmentally disabled person to obtain a base hunting license when accompanied and directly supervised by a person 18 years of age or older. SB 392: Adds a new section to state code that allows the Division of Corrections and Rehabilitation to pay contract claims that are not otherwise provided for. The division audits the payment claim, and if the claim is determined to be valid, payment is processed through the State Auditor and the Treasurer. The bill also authorizes payment of unaudited payment where the claim has been reviewed by the division and found to be fair, equitable, and to the advantage of the division, and all parties have agreed to a settlement of the claim. SB 398: The bill would limit the per diem rate of compensation for senior status justices and judges to $430 per day and provides that a senior status judge or justice may not receive a combined total of retirement benefits and per diem compensation in a calendar year that exceeds the annual salary of a sitting circuit judge. The bill also allows senior status justices and judges to receive reimbursement for actual expenses incurred in performance of their duties. The bill also requires the State Treasurer, as custodian of state funds, to petition the Supreme Court of Appeals for a writ of prohibition prohibiting the State Auditor from issuing any warrants for the payment of a senior status judge or justice in excess of the compensation limitations in the bill. SB 399: The bill would amend code to limit the per diem rate of compensation for senior status magistrates to $200 per day and provides that a senior status magistrate may not receive a combined total of retirement benefits and per diem compensation in a calendar year that exceeds the annual salary of a sitting magistrate. Amends the definitions of “employee” and “employer” within the PEIA statute to make coverage available to employees of public charter schools established under this bill. Additionally, it further amends the statute to provide that an employee who is eligible for coverage may use accrued sick leave toward the premium cost of insurance. For every ten days of accrued sick leave, the employee will be credited one additional month of coverage for the retiree and his or her dependents. Modifies levy rates for county boards of education and allows county boards to increase their regular levy rates through a majority vote of their members. Creates a $250 tax credit for the purchase of supplementary education materials or professional development costs incurred by a classroom teacher employed by a public or private school. New language which states that county boards may establish an open enrollment policy without charging tuition and without obtaining approval from the county board. The policies are to identify admission criteria, application procedures, transportation provisions, timelines for open enrollment periods, and restrictions on transfers due to building capacity constraints. The new language sets out instances in which the county board may give enrollment preference and requires the county to comply with all enrollment requirements for children who are in foster care or who meet the definition of unaccompanied youth. An appeal process is created through the state board of education. The provision also allows for the potential that a transferred student could choose to return to a school in his or her county of residence after the second month of any school year. The state superintendent is authorized to permit more than 28 pupils per teacher in a classroom for grades 4-6 for the purpose of physical education. 28 pupils per teacher in grades 1-6 in the event of extraordinary circumstances and upon application by a county board. Explains that school counselors’ main responsibility shall be providing direct counseling services to students. Removes language related to tenure and clarifies that central office administrators, supervisors, and directors, hired after July 1, 2020, shall serve at the will of the superintendent and may be removed upon approval of the county board. Adds a new section that modifies the school calendar and states that the code defines the school term both for employees and for instruction. The new language states that the use of equivalent time gained to cancel days lost and the use of alternative methods to deliver instruction on canceled days are considered instructional days for meeting the 200-day minimum employment term and the 180-day minimum separate instructional day requirements. It further clarifies that when a concerted work stoppage, or strike, by the employees assigned to a school causes the county to close the school, the county board shall withhold the pay of the employees for each day the school is closed. The withheld pay shall be paid by the county to employees who subsequently fulfill their assigned duties for the instructional term and the employment term as per their employment contract. Adds a provision which states that the teacher’s recommendation relating to a student’s promotion to the next grade shall be a primary consideration. Authorizes the establishment of public charter schools and defines terms, including: “authorizer,” “public charter school” and “teaching member.” This section lays out basic instruction for the implementation of public charter schools within a community. Requires that the attendance director or administrators shall make contact with the parent, guardian or custodian of a student to ascertain the reasons for unexcused absences and what measures the school may employ to assist the student in attending. Adds language to the definition of “professional student support personnel” to include social workers and psychologists. States that for the 2019-2020 fiscal year and after, the basic foundation allowance for professional student support personnel is the amount of money required to pay the state minimum salaries subject to certain criteria. The bill also amends the percentage of each county’s allowance for current expenses from 70.25% to 71.25% of the county’s state average costs per square footage per student for operations and maintenance amount. Bill amends the powers and duties of the state superintendent concerning exceptional children, adds language that a separate appropriation shall be made to the department of education and be disbursed to county boards and public charter schools when assisting with serving exceptional children. Creates the Education Savings Account Act, or the ESA Act. An ESA is an education saving account to which funds are allocated by the Treasurer to the parent or parents of an ESA student in order the pay qualifying education expenses to educate the student. The bill increases the 2019-2020 salaries for teachers and school service personnel. The increase for teachers is $2,120 annually, and for school service personnel the increase is approximately $115 per month. Effective July 1, 2020. New language gives counties the discretion and flexibility to use local county funds, not otherwise factored into the public-school support program, to provide the best education to their students, including by providing salary supplements to teachers. Allows county boards of education to base its employment decisions on an employee’s qualifications as defined in county board policy. Requires county boards to provide annual notice of insurance coverage to school employees, with notice being sent via email or first-class mail. Requires personal leave to be accrued at the end of each pay period based on a ten month pay calendar or on the last workday for separating employees. Modifies the Underwood-Smith Teaching scholars Program. As of 4 p.m. on Friday, February 8th, 944 bills have introduced in the House of Delegates. Of those bills, 77 have been passed. House Bill 2363 would authorize the length that the Upper Kanawha Valley Resiliency Program to be extended to the end of October 2024 instead of 2020. The program is required to report its findings and accomplishments to the Legislature every October until then. This program is an effort to revitalize the upper areas of the Kanawha Valley, an area that has been economically struggling since the closure of a community college within the region. House Bill 2691 would change the expiration dates for newly issued concealed carry permits in the state of WV. Instead of the expiration of these permits occurring five years to the date of application, this bill would mandate that the expiration occurs on the applicant’s birthday after the permit has been active for five years. This would ensure simplicity as to when the licenses expire, and aligns the expiry of concealed carry licenses with state drivers’ licenses expiration dates. Senate Bill 268 updates the meaning of federal taxable income in the West Virginia Corporation Net Income Tax Act. The provides that for tax year 2018, the meaning of terms in the West Virginia statues relating to corporate net income taxes will have the same meaning as those terms have under federal statutes as amended between December 31, 2017 and January 1, 2019. Senate Bill 269 updates terms used in personal income tax act. The bill would amend provisions of the WV Code relating to the WV personal income tax. The bill provides that for tax year 2018, the meaning of terms in the West Virginia statutes relating to personal income taxes will have the same meaning as those terms have under federal statues as amended during 2018. House Bill 2004 provides for a program of instruction in workforce preparedness. House Bill 2420 establishes the Mountaineer Trail Network Recreation Authority. House Bill 2666 relates to supplemental appropriation to the Department of Veterans Assistance. The purpose of this bill is to appropriate $6,200,000 in general revenue for the fiscal year ending June 30, 2019 to the Department of Veterans’ Assistance, for expenditure during the fiscal year in 2019. House Bill 2668 relates to supplemental appropriation to the Department of administration, Public Defender Services. The purpose of this bill is to appropriate $15,300,00 in general revenue for the fiscal year ending June 30, 2019, to the Department of Administration, for expenditure during the fiscal year 2019. House Bill 2392 is a bill which would allow 1-day licenses to be issued by the Alcoholic Beverages Commission for charitable events. This would allow those who are hosting a charitable event to apply for a single day license to sell non-intoxicating alcohol, such as beer and wine. House Bill 2545 would exempt purple heart recipients and other military veterans receiving other specific distinguished awards from paying a state vehicle registration fee. West Virginia individuals who qualify for this exemption would be allowed to put it towards one noncommercial vehicle. House Bill 2554 would establish attendance zones in the state that would designate which schools a student would attend. The bill would also allow counties to voluntarily have “open enrollment” policies which would allow students to transfer into a school without preclearance from their original school, as current statute mandates. House Bill 2740, a bill that specified the instances in which parent can get inheritance from a child and vice versa. This bill would specify that in the state of West Virginia, a parent cannot take their child’s inheritance if their parental rights have been or could have been taken away. It also provides that as long as there isn’t a present will, a child can reap inheritance from a parent who does not have parental rights. This bill would ensure that a child can still receive inheritance. House Bill 2601 would ensure the review and approval of state property leases by requiring two signatures and the review and approval of leasing of state property to nongovernment entities. House Concurrent Resolution 25 is a resolution that would request the Joint Committee on Government and Finance to study and analyze the discrepancy between estimates and actual readings of electrical meters. This is due to widespread state complaints regarding electrical meters. House Bill 2583 is a bill that would permit a pharmacist to dispense a self-administered hormonal contraceptive under a standing prescription drug order. The proposed legislation would create an opt-in program, where pharmacists could voluntarily dispense a 12-month supply of hormonal birth control. Pharmacists who wish to opt into this program must receive training and administer the proper counseling to patients who seek to receive the contraceptive drug. House Bill 2359 would exempt commercial motor vehicle operators employed with a farm related service industry from the commercial driver’s license requirements. West Virginia citizens employed in the fields of agrichemical business, harvesting, livestock feeding, and other applicable careers would be exempt from getting a commercial driver’s license for a limited time. House Bill 2801 is a bill to require abortions performed in the state to be performed by a licensed physician. As amended, House Bill 2801 specifies that surgical abortion procedures must be performed by a licensed physician, thus preventing nurses from performing surgeries they’re not licensed to perform. House Bill 2867 is a bill that would move the Medicare Fraud Control Unit from the jurisdiction of the WV Inspector General’s Office to the WV Attorney General’s Office. Mary Ann Maurer, President of the WVAFP, comes to the Capitol to participate in the Doc for the Day Program for a fifth time since 2014.